You know how sometimes you find that perfect pair of jeans, or that perfect corderoy jacket, or that sublime top that is just perfectly you, that you wear all the time until it has holes in indecent places or until it is literally falling apart at the seams? I knit a tank top like that once. It was the spring of 2004, my freshman year of college. My life was a mess, and I was just re-learning to knit. If for some reason you have not heard of this stuff, let me explain. Acrylic yarn can be nice. It can be soft and shiny and lightweight, and there are loads of versions out there that are great for people with a low budget and/or wool allergies. This is not that kind of acrylic. This is acrylic from the ’70s. Acrylic that will endure the apocalypse as long as cockroaches. Acrylic that makes your hands sweat and your needles squeak if you knit it at the recommended gauge. But I was determined. 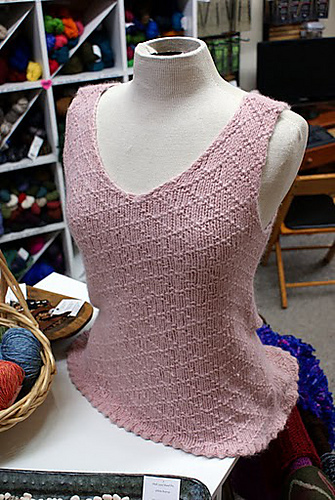 At something like 3$ for a giant ball back in 2004, I knit this top out of 1 1/2 of them, using the silhouette of shirts that fit me and a diamond stitch I found in an old stitch dictionary I got at a yard sale. I had heard of this thing called a “picot edge,” so I tried one. It seemed all right, so I wore it, and washed it. And wore it, and washed it, etc. As time passed, I grew as a knitter, and my taste improved with my knowledge of the craft. (I also started using salon-level hair products, until a seminary living budget nixed that. I miss my Biolage!) But this amazing thing happened – I was still wearing the tank top. When I stopped to find out why, the reason was even more shocking. Acrylic is basically plastic. This is why you generally shouldn’t baby blankets from it – In fire, acrylic melts into a horrible black sticky goo that fuses to whatever surface is available. This is also why, on labels for acrylic yarn, it tells you not to iron it. It probably won’t melt (I’ve ironed Red Heart before I knew better; it just flattened), but it does “kill” the acrylic. This means it loses texture and gets kinda saggy. Over time, washer-ing and dryer-ing and wearing my tank top had very, very slowly “killed” the acrylic. What this did was stretch out the stitches, creating a wonderfully drapy, cool fabric. It also slightly changed the look, so it’s a little shiny. It’s also very soft. This “killed” acrylic was the perfect washable summer fabric. Washability is still important to me. I believe completely that handknits are absolutely worth handwashing, but I handwash clothes about as often as I handwash my refrigerator (which I usually do right before I move). So when it comes to things that get exposed directly to the skin, like tank tops (I’m a sweaty girl) and socks, if I don’t use a washable yarn, that means I will wear it once, then forget about it for a year. It goes fast. It was meant to be my June term project, but it only lasted me 3 days of class. You can get it now for $5 on Ravelry by clicking the title of the pattern above, or the button strategically placed below. How did I not know you knit back in freshman year?! I didn’t back then, but I was “knit-curious.” Also, that’s a really awesome tank top. oh rofl @ “knitcurious.” well, I didn’t really start until mid-spring, and i was a couple years away from being brave enough to knit in class and things like that. when did you actually start?